The war in the South Pacific, a country doctor in Colorado, victims of industrial pollution in a Japanese village--all were captured in unforgettable photographs by the legendary W. Eugene Smith. 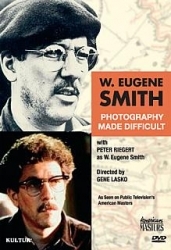 This program showcases over 600 of Smith's stunning photographs and includes a dramatic recreation in which actor Peter Riegert (Crossing Delancey, Local Hero) portrays the artist using dialogue taken from Smith's diaries and letters. Interwoven through the program are archival footage and interviews with family and friends of this brilliant, complicated man, whose work developed from twin themes of common humanity and social responsibility.